BBMRI-NL – The Biobanking and BioMolecular resources Research Infrastructure - Netherlands – represents over 200 biobanks in the Netherlands that facilitate studying population-based cohorts. In the last decades, BBMRI-NL has collected valuable phenotypic and molecular data on over 1,000,000 Dutch individuals and a catalogue of available phenotype data is available here. The X-omics cores and nodes will closely collaborate with BBMRI-NL to provide researchers with both well-defined cohorts and available data collections (role BBMRI-NL) and the tools to assess biological samples at a much more comprehensive and detailed molecular level (role X-omics). Health RI, an interconnected data infrastructure for Dutch personalized medicine and health research. This facility was designed by the Dutch Techcentre for Life Sciences, together with ELIXIR-NL, BBMRI-NL, EATRIS-NL, NFU, VSNU and Health-Holland and is supported by 60+ stakeholders. Proteomics: Between 2011 and 2015 the Utrecht core-facility was the coordinating hub of the European Large-Scale Infrastructure in Proteomics (PRIME-XS), which supported access and running costs but did not support hardware. A follow-up project is currently in preparation in response to a call for a proteomics infrastructure in the EU H2020 framework program. The Dutch proteomics facilities provide access to a very wide range of both academic and industrial partners. The Utrecht core-facility is also involved in the highly prestigious FET-Open project MSmed (project ID 686547). The proteomics community collaborates with other large-scale facilities such as the European Bioinformatic Institute (EBI), and the ESFRI landmark project INSTRUCT for integrated structural biology. Metabolomics: The Netherlands was one of the drivers behind the MetabolomeXchange, a portal for metabolomics studies, and is heavily involved in establishing metabolomics for BBMRI-NL and to establish an Elixir metabolomics network in Europe. Additionally, Leiden University is also part of the EU H2020 PhenoMeNal consortium, which aims to establish a virtual metabolomics and phenomics infrastructure together with EBI and others European metabolomics groups. Hankemeier recently submitted MetaStar as coordinator, a H2020 infrastructure proposal to start a metabolomics community for a joint effort of the major metabolomics labs and facilities in Europe to standardize metabolomics. The MetaStar consortium will also address the training needs of new users and enable collaboration with other large-scale metabolomics and Phenome facilities. PIs are involved or leading many multi-omics H2020 projects on neurodegenerative diseases and cancer (CamPaC, CoSTREAM, SysMedPD). Genomics: In the area of sequencing technologies no real European consortia have been established, but there are coordinated efforts in specific NGS application areas. Radboudumc was also in the lead of the EU FP6 TECHNGENE project in which standards for genomic diagnostics were set (CITE recommendations/standards). The genomics community, like the proteomics community does also collaborate with other large-scale facilities such as the European Bioinformatic Institute (EBI), and is represented in the NWO Gravitation program CancerGenomics.nl (CGC.nl), contributes genetic analyses for the national organoid icon project (Clevers) and the Center for Personalized Cancer Treatment (CPCT). When it comes to rare diseases, involved partners have direct links to nearly all European Reference Networks(ERNs), and coordinate several of them. 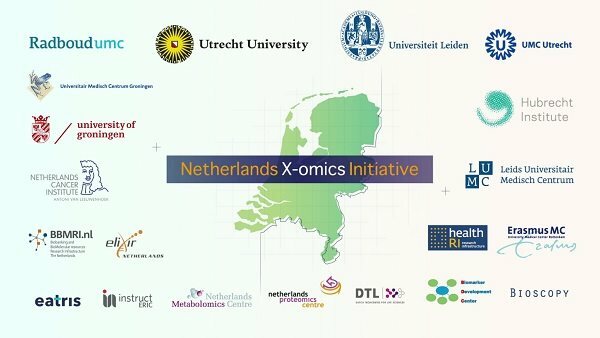 Data integration and analysis: The genomics, proteomics and metabolomics experts in X-omics are taking part in multiple European research consortia (funded for instance by H2020 and IMI) where they apply their technological skills in collaboration with other omics or bioinformatics scientists and life science researchers. The Biomarker Development Center recently initiated the COST action CliniMARK, in which over 25 countries and industries are assembled to exchange knowledge on optimal translation of X-omics information to validated biomarkers and impact in healthcare. The members of the X-omics consortium take part in the major translational European Research Infrastructures EATRIS, BBMRI-NL and ELIXIR(e.g. van Gool chairs the Biomarker Platform of EATRIS covering 34 translational medicine institutes across Europe). Collaborative steps being taken by these infrastructures towards definition and implementation of Good Biomarker Practice guidelines3.